2014 is a major election year, with both federal and state offices on the ballot. On September 9th, the city will hold a primary election for state offices. If you are enrolled in a party, you may be selecting your party’s candidate for offices such as governor, Lieutenant governor, State Assembly, and State Senate, as well as party and judicial races. 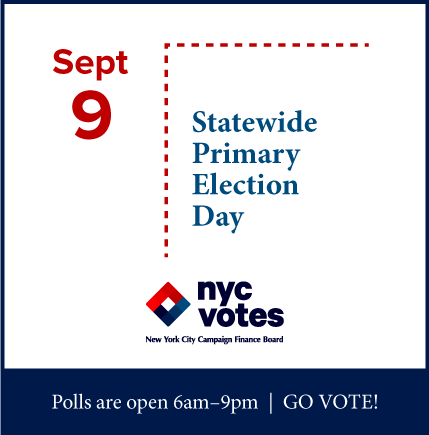 This online Guide covers primary candidates for state offices that represent New York City, and includes links to their websites and social media pages as available. You can also visit the League of Women Voters' Vote411.org voter guide, to view profiles for many of these candidates. In addition, this guide lists candidates for party offices on the ballot, although social media and website links are not available for these races. Need more information about how and where to vote? Look under the All About Voting tab above for frequently asked questions, voter rights, and more. You can find your poll site and view a sample ballot at nyc.pollsitelocator.com. There will be a general election for both federal and state races on November 4th. If you aren’t registered to vote, the deadline is October 10th, so download a registration form today!. Stay up to date on city elections — follow NYC Votes on , like us on , or sign up for election alert emails today! Enter your address to view the candidates who you can vote for in your district.